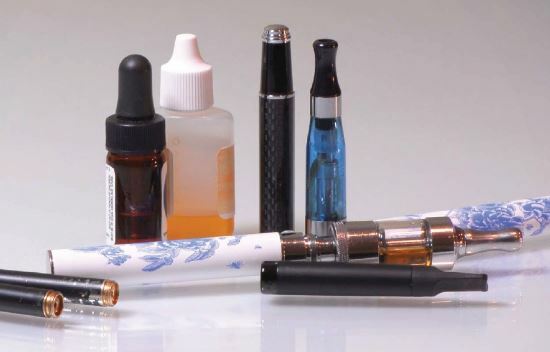 The U.S. Fire Administration report shows various forms of vaporizers and e-cigarette products. The item models shown were not necessarily involved in any fires or other incidents cited in the report. (CN) – More than 120 lawsuits were filed across the United States in 2017 by plaintiffs claiming they were hurt in explosions and fires caused by e-cigarette batteries. A cluster of pending cases in California state courts, handled by Gregory Bentley of Schernoff Bidart in Claremont, includes claims from one plaintiff who lost an eye and had his facial bones smashed in an alleged e-cigarette battery explosion, and another who underwent skin grafts after his vaporizer battery purportedly burned him in front of his children. Bentley is known for having secured a $1.9 million verdict in Riverside County Superior Court in 2015, on behalf of a client who was injured when an e-cig battery failed, causing the client’s dress to catch fire while she was in a car with her husband, according to an LA Times report. His firm’s pending pleadings allege that e-cigarettes (aka vaporizers or “vaping” products) lacked proper labels to warn consumers of battery fire risks. The first wrongful death lawsuit in the Courthouse News database over an alleged e-cig explosion was filed last month. The complaint alleges that a vaporizer device launched shrapnel into 30-year-old Thomas Gangi’s head while he was in his Bohemia, N.Y. home, in Nov. 2015. Gangi died in the fire, his estate says. “E-cigarettes will continue to cause these types of injuries unless and until those placing them in the stream of commerce are held accountable. Even industry proponents … acknowledge that no universal method of testing e-cigarettes has been adopted,” the lawsuit reads. 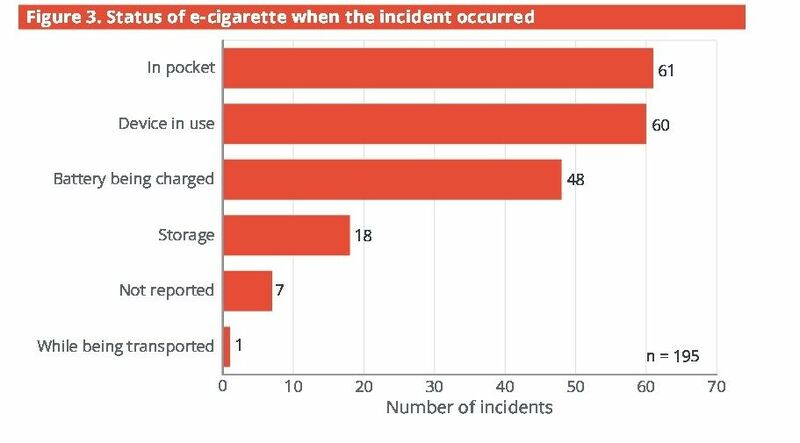 The U.S. Fire Administration’s chart breaks down categories of e-cigarette explosions and fires, for a series of incidents documented from 2009 to 2016. The complaint says that U.S. distributors choose to import vaporizer products from China because of the low cost and “non-existent quality control,” a phrase that has become boilerplate language in vaporizer battery explosion suits. U.S. Fire Administration statistics indicate that e-cigarette fire incidents have increased exponentially since 2012, coinciding with rapid growth of vaping products into a popular alternative to smoking tobacco. E-cigarettes have turned into a multibillion-dollar industry, and according to a 2016 National Health Interview Survey, roughly fifteen percent of adults reported that they had used vaping products at some point. In an interview with Courthouse News, Gregory Conley, head of the vaping advocacy group American Vaping Association, said that e-cigarette battery fires are caused in large part by user error. For instance, when a battery combusts in a person’s pocket, Conley said, it’s often the result of the consumer allowing the unit to touch loose change or other metal material, which can cause overheating and product failure. Conley claims that with respect to explosions while in use, consumer missteps in handling modular parts (“mods”) and rebuildable vaporizer components are largely to blame. “It’s rare to see a case where there was no manipulation of the product, i.e. rebuilding a coil with such low resistance that you’re setting yourself up for danger,” he said. The American Vaping Association has concerns that small retail vape shops, which are commonly named as defendants in the litigation alongside Chinese battery manufacturers, are not financially equipped to handle the influx of litigation. He said that in one piece of litigation, it turned out that the plaintiff couldn’t remember where the e-cigarette product at issue was purchased, so a lawyer “just picked out a random vape shop” to name as a defendant. As Conley points out, lithium batteries have had a history of safety issues not limited to the vaping industry. Multiple reports of battery failures in Samsung’s Galaxy Note 7 prompted a recall which cost Samsung an estimated $3 billion. Going farther back, computer maker Dell recalled millions of laptop lithium batteries in 2006 over safety concerns, then one of the largest product recalls of its kind. “It is this intimate contact between the body and the battery that is most responsible for the severity of the injuries that have been seen,” the Administration wrote in a July report. The Fire Administration said that in a typical e-cig battery failure, flammable electrolytes in the lithium battery overheat, causing pressure to build until the seal at the end of the battery bursts apart. Components can be propelled across the room “like a bullet or small rocket,” the USFA stated. The administration concluded in its report that the current generation of lithium batteries is “not a safe source of energy for these devices,” and recommended that manufacturers seek alternate power sources. It acknowledged that “there are no regulatory standards directly applicable to e-cigarettes,” and that decisions about battery safety measures were left to manufacturers. Conley said that a viable power-source alternative to lithium batteries for vaping devices may be a long way away. Though irresponsible rebuilding and mismatching of “mods” appear to have played a role in some fires, the practice of making vaporizer products customizable will likely remain prevalent, Conley said. “It’s a fine line to walk because the modifiability of devices and the ability to design your own vaping experience is part of what attracts people to the products. … When done properly, it’s safe,” he said. He claims he’s optimistic that the number of incidents and injury claims will decrease due to better consumer education on battery safety, as well as a move towards products with enclosed batteries. Both his group, the American Vaping Association, and the Smoke Free Alternatives Trade Association (the self-described “voice of the vapor products industry”) have lamented U.S. regulators’ decision to consider vaporizers “tobacco products” under the Family Smoking Prevention and Tobacco Control Act. The advocacy groups claim the FDA’s decision to regulate vaping products under the Act will freeze safety innovation by forcing manufacturers to submit cumbersome product applications for each new product or product modification. Under the FDA’s current framework, vape products that were already on the market before Aug. 2016 can remain on the market in their current state until Aug. 2022, a cutoff date that was recently pushed back from the original 2018 deadline, according to online magazine Vaping360. The vaping industry’s battery safety concerns meanwhile are playing out against the backdrop of a broad public debate over vaporizers’ purported health benefits over smoking tobacco. The industry maintains that the devices’ “e-liquids,” which are placed in e-cigarettes and heated to a low temperature, offer a safe alternative to tobacco and provide a powerful method to quit smoking. The liquids typically contain a carrier medium like propylene glycol, as well as flavorings and other ingredients including optional nicotine at graduated concentrations. Regulation is by all accounts evolving, however, and the long-term effects of inhaling various e-liquid ingredients have not been studied extensively due to the novel nature of the devices. Last year, the United Kingdom’s Medicines and Healthcare Products Regulatory Agency stipulated that the additive diacetyl should be banned for use in e-liquids in the U.K. under the EU Tobacco Products Directive. Shenzhen Kangside Technology Co. Ltd., a purported Chinese manufacturer named as a defendant in the recently filed wrongful death lawsuit, has not responded to a request for comment, nor has battery charger company Anker Technology, another defendant in the case.